The SU-152 is a Rank III Soviet tank destroyer with a battle rating of 5.0 (AB/RB/SB). It was introduced during the Closed Beta Test for Ground Forces before Update 1.41. This vehicle was created on KV heavy tank chassis. It carries the powerful 152 mm ML-20S howitzer. A 25 mm plate covers front joint area between the front and lower hull glacis. Ammo racks of the SU-152. 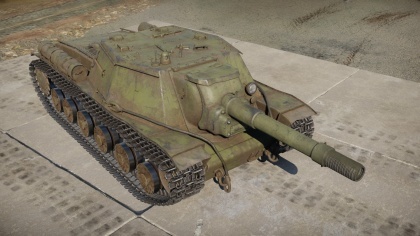 The SU-152 is a tank destroyer that serves many different purposes; the most accurate way to observe this vehicle is as somewhat of a "big brother" to the SU-122 and as the "cousin" of the KV-2. However, this vehicle features many differences from its closest predecessors. For example, the SU-152's BR is higher without any noticeable gain in firepower over its relatives. This presents a problem as the SU-152 will no longer be able to perform its trademark "one-shot" hits with the high-explosive rounds as often. However, unlike the other vehicles that fill the same role, the SU-152 gains access to highly effective armour piercing high explosive (APHE) ammo. 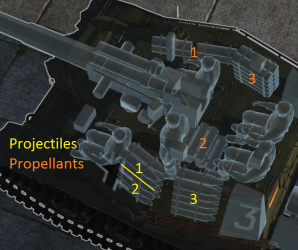 This is the pinnacle of the SU-152's effectiveness. Nonetheless, turret shots with HE shells are still a viable option in combat. Due to the vehicle's BR, players are more likely to know and counter your strategy. Thus, the 152's new armour piercing rounds may come as a rude surprise. The biggest threats you will encounter at any point whilst playing the SU-152 are enemy tank destroyers. The dreaded Panzer IV-derived tank destroyers pose a significant threat; they can punch through the SU-152's armour at ranges of more than 1000m with the L70 gun while remaining at the extreme edge of your own effective firing range. Another frequent threat are the M10 and M18 tank destroyers. Boasting both range and speed, these machines can either destroy you from distances that you cannot hope to match, or completely avoid your fire while still creeping closer. The final threat to this TD is actually centered on the vehicle itself: an extremely long reload time that leaves little room for error. One missed shot from within your enemy's effective firing range can mean your undoing. Makes up for speed with great turning time when stopped. During Operation Uranus, when the Soviet Army was able to successfully encircle the German Sixth Army inside Stalingrad, there were some weaknesses pointed out in their armoured formations. One was the need for heavy guns that could also be mobile, as there were many German fortifications that were unable to be handled by the front-line troops. The Soviet heavy artillery at the time, the 152 mm howitzer, was very heavy and could not be effectively towed from place to place due to unsuitable terrain and lack of capable transportation. Though they experimented with a propelled version of the gun with the KV-2, the tank was phased out of production by October 1941. In November 1942, the State Defense Committee attempted to fix this by ordering the development of a heavy self-propelled gun with the 152.4 mm ML-20 howitzer as its main armament and was to have greater mobility, armour, and better production cost. The development of this project had actually been going on for a while and was considered before the order for its development, but the SU-152 was cancelled due to urgency of standard tank production in the war. The project started in December 1942 among three different design teams from different factories. All the designs ended up with the 152 mm howitzer, and the utilization of the KV-1S chassis. After evaluations, the design from Josef Kotin was chosen for further development and production as it had the gun and chassis combined with minimum cost. The project was then designated the KV-14 and the first prototype was called "Object 236". The vehicle was complete rather quickly in only 25 days and trials began on January 25, 1943. The vehicle was then approved for production at the Chelyabinsk Kirov Plant on February 14 and accepted into service. The name was changed into its designation SU-152 and was produced from February 1943 to December 1943 with only about 670 units produced. The design of the SU-152 followed standard Soviet format for self-propelled guns. The fighting compartment was fully armoured in a casemate structure to protect the crew. The crew consisted of four people - the gunner, loader, and commander were positioned beside the gun and the driver near the front. The armour on the SU-152 was about 75 mm on the front and was sloped for better protection. The 152 mm howitzer was mounted slightly to the right of the vehicle and had a limited traverse vector. The SU-152's suspension system was made up of torsion bars from the KV-1 chassis. Observation from inside the vehicle consisted of periscopes on the roof hatches and two gun sights (a panoramic and a telescopic sight). Its communications featured an intercom system installed for use with a single radio plus a radio for communication with other SU-152s. Inside, the crew's armament was made up of a few submachine guns and grenades. The SU-152 proved devastating in its role, and the first batch was issued to the newly formed heavy mechanized gun regiments in May 1943. The first of these regiments with twelve vehicles saw action in Kursk, but was further supplemented with nine more during the battle. The regiments' organization throughout the war was for 21 vehicles in a regiment with three batteries of seven vehicles with one KV-1S tank commanding the regiment. Despite its role as an anti-fortification artillery piece, a role it performed with standard HE rounds, it was also one of the Soviets' best anti-tank weapons. It was classified as a dual-role heavy assault gun and a heavy tank destroyer. Its large cannon could even destroy the new Panthers, Tigers, and Ferdinands with relative ease by utilizing the spalling and blast concussion effects produced by its large high explosive shells. Because of such a capability of the vehicle to destroy better German tanks, it earned its nickname as the Zveroboy, or the "Beast Slayer". The reports of the "SU-152 effect" on target is said to have been able to take the turret off the Tiger I at any range with just the HE shell. The SU-152 was reported to have caused numerous armoured fighting vehicle losses to the German side. One commander, Major Sankovskiy, who commanded an SU-152 that destroyed ten German tanks in one day, was awarded the Hero of the Soviet Union. After Kursk, the SU-152 continued to serve as the Soviet Army's primary anti-fortification weapon in all of its front lines, especially during its Operation Bagration offensive in summer of 1944. However, production ended in December 1943 and thus combat losses caused a decrease in SU-152 quantity in Soviet inventory. 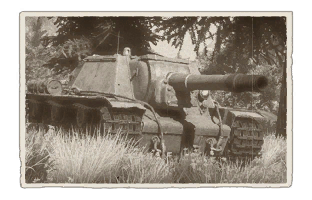 This halt in the production was due to the introduction of the better armoured and more reliable ISU-152, which was based off of the newer IS-2 heavy tank while still keeping the same gun and combat role. Despite that, the SU-152 remained in service until 1954, when the Soviets decommissioned, scrapped, or sold their remaining SU-152s to other allies such as Syria and Egypt.